This utility is able to update any kind of databases, where the update is based upon a set of description-files (*.NTA, *.NTB, *.NTC). The update-utility itself supports structural changes (updates) with preservation of the existing data as well as a change of the data in a record on a specific database (initializing). Thanks to my boss I'm now able to give it away for free, the source code that is! 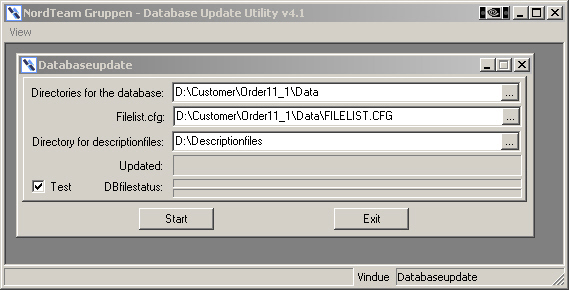 The update-utility is able to initialize the databases to make sure that certain information is present after the database is updated, including the CODETYPE and CODEMAST databases. An example of this would be to make sure that certain choices in combo-boxes are present, or maybe you want to change a supervisor password, update system files... you name it! The initializing process can be forced to use indexes to make sure that no duplicate records are created. The update-utility is using FIELDNAMES rather than field numbers, so it is possible to insert fields anywhere inside the database. The update-utility is able to understand "Known-Issues" files (NTK file). In these files you can define which fieldnames are identical. By keeping these files you can update previous versions of databases without needing to know what version the end user has. you can update any previous versions. - TEXT-fields can not include Linefeed-characters such as a RETURN/ENTER-character. The field can be considered a ASCII-type where data can be of one long text-line. - BINARY-fields can not be initialized. - OVERLAP-fields can not be initalized by themselves, only by the fields that the OVERLAP-field is build upon. The textfile is an example of how to make a "Known Issues" file. What it contains is instructions to the update utility what to do when the update utility finds a fieldname in the old database that is not represented in the new database. As for now you will have to make this file on your own (i.e. with notepad). 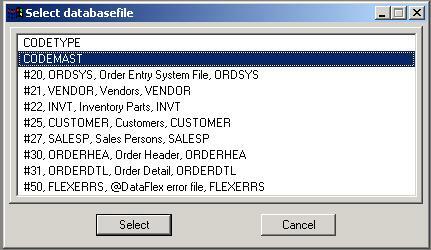 Give the name for the file the same name as the physical name of the dataflex-file. In the example the dataflex file could be VTXT.DAT and the "Known-Issues" file would then be "VTXT.NTK". The extension .NTK tells the update utility that this is a "Known Issues" file. When the update utility meets a fieldname in the old datafile that it cannot find in the new datafile it will search the information in the "Known Issues" file for the specific datafile. update utility to handle the fieldnames as the same field and any changes made to the field are updated without loss of data. The field with the name "Num" in the VTXT-file has been renamed to "Vtxtnum"
"IDENTICAL , @PASSWORD , PASSWORD"
"PASSWORD" in the updated VTXT-file. Please note that the update utility is case insensitive regarding the instructions and fieldnames, and also insensitive regarding how many spaces before or after each instruction and fieldname. One thing though, each instruction has to start on a new line! before the update-utility was started. The update-utility consists of 2 applications, a version that is to be operated manually and a full-automatic version. The manual version is for the developer where you can test an update and make notes on for example fieldname changes. This is also the version to use when you need to make description (*.NTA, *,NTB, *.NTC) files and/or the initialize-files. The other version (for the end user/customer) only consists of progress bars. It will start the update when invoked and close by itself when it has finished the update. For the full automatic part to work I am using WISE and a version number-file. their application if any of the version numbers is different from the hardcoded version number inside the application. The autoupdate utility works with registry keys to tell where to find the complete database, the filelist and the descriptionfiles, the initialization files and "known issues" files. As for the Update database you can specify multiple datapaths i.e. "H:\Data1;H:\Data2" or "\\Server\Data1;\\Server\Data2" and so on. The Update Filelist could then be "H:\Data1\Filelist.cfg"
The description files (and initialize files, known issues) should be placed in a separate map and that could then be "H:\Descriptions". In WISE these files are placed in a temporary map and after the update utility has finished the map is erased. You can compile this program with the compiler from VDF5/6 and 7 without the need to create a workspace first. Just select [defaults] as workspace and choose the filename. (as for VDF8+ it is now IDE aware and can be registered with normal .ws file). Hit the compile button after that. When you start the program you can start with generating description and initialize files. We are going to show you an easy example where we will add an extra record into the codemast file for the shipping type. Assume that you have a customer using the order-entry example and that they want to have the option that customers need to pay before anything is shipped. We are going to call this a prepayment. 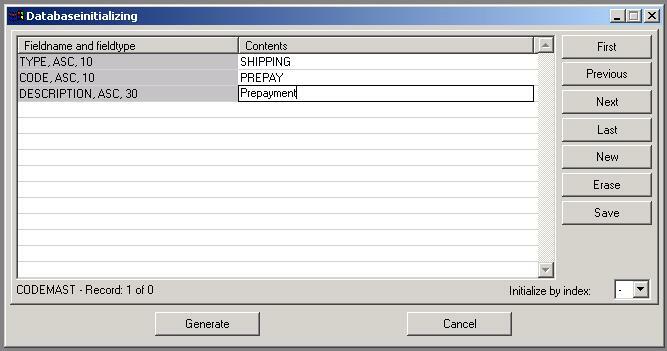 So, we will need to add a line with the option "PREPAY"
First select the datadescription view. Selecting the <start> button will write out all the necessary description fields. When you select the <Initializing> button, the update utility shows a list of datafiles in a selectionlist from where you can select a datafile to initialize. Select the CODEMAST file. If the datafile already has an initialize file, it will be marked with (init) before the filename in the list. A new window will popup and this one you can specify new records that should be present after the datafile has been updated. All the fieldnames are listed in the view and each row represents a field in the datafile. All data is handled in internal memory and is not written to an initialization file until you select the <Generate> button. When you are done select the index that should be used during initializing the datafile. When choosing an index file, you make sure that the initialisation does overwrite existing data and therefore not causing duplicate record errors. This is also why you can change for example a supervisor password (requiring that the password field is not part of the index *S*). What we have done here is just entered our data, clicked on the <save> button to store the new record in memory and after that selected index 1. Then you can click on the <Generate> button so that the initialization file is actually written to disk . The destination of the file is the path specified in the Description form and it will be named the same as the physical name of the datafile with the extension "NTI" (i.e. "CODEMAST.NTI"). The update utility will automatically initialize a file if an initialization file for the updated file is present in the description-path. The reason I write "dummy" to CODETYPE.NTA and CODEMAST.NTA is the fact that the update utility only updates those files that have a .NTA file in the description map. Now the CODETYPE and CODEMAST files are never (or should never be) updated, but we would still like to have the chance to initialize these files. The presence of the NTA-file is the handle access to access these. Note for if you try to run this example, be aware that by default the flexerrs file is not physically available in the data folder while it is listed in the filelist. You have to copy this file into the data folder before running the example. I use the manual update utility to prepare for the automatic update utility. When I'm done creating the initialization and description files I test to see if the test database (a customer database or deploy-version) work. Then I examine the test file ("TESTUPD.TXT") to see If there are any changes that need to be solved using the "Known Issues" files. Then I make the "Known Issues" file(s) in the description-map. After that I try it again to see if the test resolves the issues I've written in the Known Issues files. Now would be a good time to update the database without the test-option, and then run a test to se if the test file does not report any changes at all. This will also help out other people which might have the same questions as you. In the zipfile, you will find both version 2.0 and version 3+. 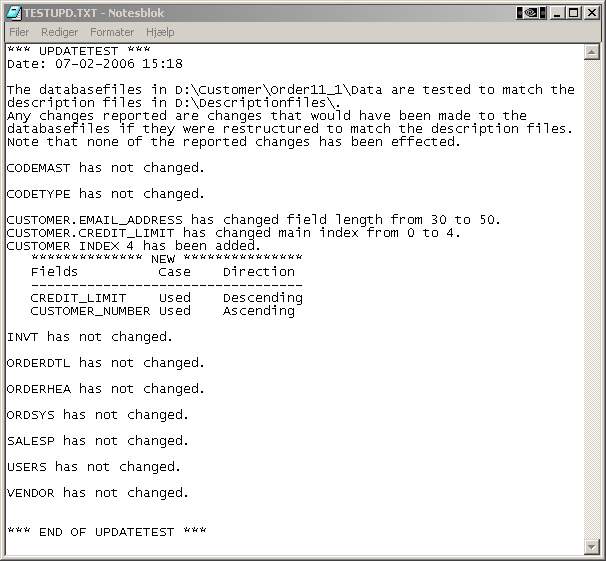 Here is an example of how a testreport could look like when testing af databaseupdate. First I made a copy of the database in the Order11.1 example workspace. Then I changed some in the customer database file. Here is a manual update preformed with the test attribute ON. It will go through the update and report any changes in the database that would make an update but with out actually updating anything. This is a good tools to se if there are any changes in the database and if so what the changes are. You can also do that on MS-SQL and Pervasive databases. -	Field Email_address is changed from 30 to 50 characters. -	A new index is added with Credit_limit in descending order and customer_number as second segment.